Love ice cream? I do too! International Delight has three brand new flavors of their creamers, all based on Cold Stone Creamery flavors. How fun is that? I chose the Brownie Sundae to try. It tastes and smell just like brownie sundae ice cream! So good! I knew I wanted to do a recipe for the creamer, but I had a little trouble landing on something that seemed just right. I really wanted to highlight the Brownie Sundae taste in the treat. To be honest, when I initially thought of baking the creamer into a muffin, I didn’t think it would turn out very well. I expected it to be just so-so. But since I didn’t have any other ideas, I decided to test it. Oh goodness! These muffins turned out to be fantastic! They are moist and the flavor of the Brownie Sundae creamer comes through just fine. The glaze on top is made with the creamer too, so it’s a double dose of Brownie Sundae! These muffins did not last long at our house. We all loved them, especially that glaze that looks like melted ice cream poured over them. Fun! Stir flour, cocoa, baking powder and salt together in a large bowl. Beat butter and sugar together with electric mixer. Mix in creamer and eggs with butter and sugar. Beat until well blended. Pour liquids into dry ingredients, stir gently to combine. Fill 12 muffin cups with batter and bake at 400 degrees for 15-20 minutes. 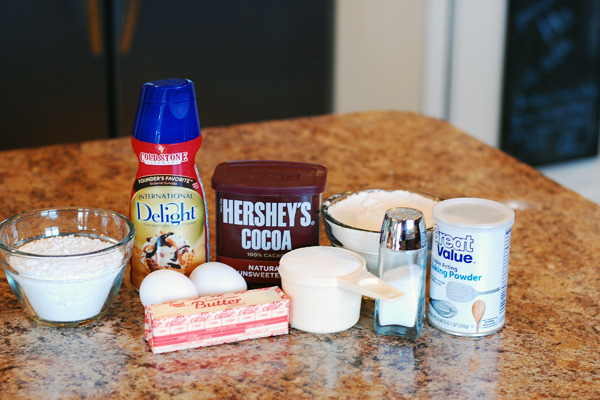 For the glaze, stir powdered sugar and creamer together, gradually adding creamer until the glaze is consistency of glue. Remove muffins from oven and cool briefly. Dip tops of muffins in glaze and cool competely. 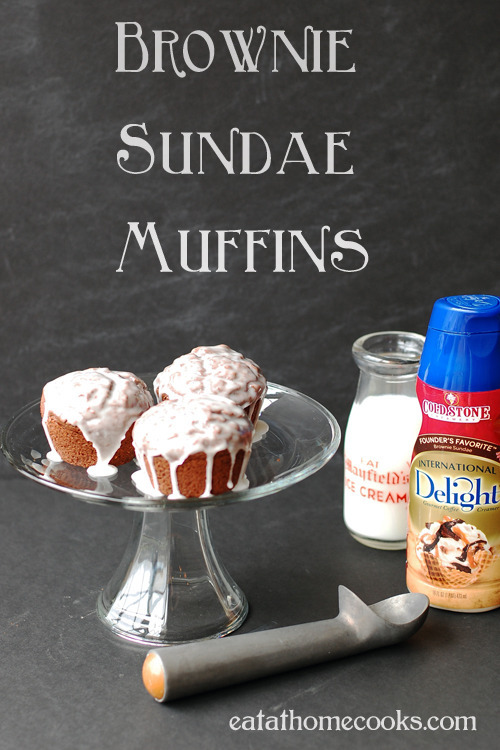 When International Delight asked me to create a recipe using their creamer, I first thought of adding it to scones or muffins. But I couldn’t get ice cream out of my mind. I love ice cream and I’ve used International Delight to make homemade ice cream several times. This time, I wanted to make a flavor based on fried ice cream. I used Cinnabon flavored creamer, along with some crunchy, cinnamon cereal. Just 4 ingredients total keep the ice cream easy. And it tastes just like fried ice cream! This did not last long at our house. It’s no secret that I love International Delight Light Iced Coffee. I’ve made it into Ice Cream Cappuccino, churned it into ice cream, and served it up with Cinnamon Chip Scones. My afternoon snack often consists of Light Iced Coffee (I like the Vanilla flavor, but it also comes in Mocha and in June there will be a new Light Caramel Macchiato to try) with animal cookies. This time, I decided those animal cookies could use a sweet dip. And what better flavor for a dip than Vanilla Iced Coffee! This is so easy to make. It would also be good with chocolate graham crackers or shortbread cookies. Ever since I first tasted International Delight Iced Coffee, I’ve loved it. I have to be careful not to drink the whole container myself. It’s so creamy and smooth and sweet and coffee tasting! I was thrilled when they came out with new Light Iced Coffee. I’m in love with the Vanilla, but it also comes in Mocha. And in June, you’ll be able to find it in Caramel Macchiato too. What’s so great about Light Iced Coffee? The fact that it only has 100 calories per serving! That means I can indulge more often. And I can enjoy it along side a sweet treat, like these Cinnamon Chip Scones. It’s like having my own coffee house at home. I’m not sure I’d ever made scones before, but these are so easy to make. The dough comes together much like biscuits, but with the addition of an egg. I used Hershey’s cinnamon chips in mine. They added a lot of flavor (perfect with the Light Iced Coffee). I also used the cinnamon chips to make a simple glaze for the top of the scones. Super easy and oh, so good!